Bio: Mike has been a PGA professional for 17 years and is starting his fifth season as the Head Golf Professional at Bellingham G&CC. Before heading north, he worked at Tacoma C&GC then Rainier CC in Seattle. A member of the University of Washington golf team from 1989 to 1993, Mike remains competitive by entering PGA sectional events, but enjoys teaching his members every bit as much as he does playing. Entire books have been dedicated to solving the root cause of the slice and turning the wicked left-to-right banana ball into a delicate draw. Fortunately, modern equipment takes the edge off the worst slices and helps golfers keep their drives on, or at least nearer to, the fairway. But this most exasperating of shots will never truly go away forever. For many, the swing that produces a slice is so heavily ingrained, the chances of hitting anything else can seem slim. Thousands of tips for slicers have been developed since unsuspecting Scotsmen first stood on the 1st tee of the Old Course and watched in despair as their drives curved uncontrollably toward the beach. And yes, most of them will work if you give them time and commit to following the method closely. Here's a great little tip a member here at Bellingham GCC showed me. Slices tend to originate in a player's set-up position. He may be too open to the target line, or he may be closed in which case he'll probably swing with a big loop and come over the top of the ball. In both instances, the clubface ends up open to the target line, and the path on which the clubhead is moving - and that sends the ball right every time. A lot of the slices I see actually start with this address position (left) where the grip is too tight and the player's right arm and shoulder are taut. The shoulders are now aligned well left of the target meaning you will take the club away from the ball on the outside and probably cut across it at impact imparting left to right sidespin. Note too the shoulders are fairly level, almost parallel with the ground. When you set up to the ball with the driver, your shoulders should ideally match the alignment of your feet and hips (usually aimed parallel left of the target line) and the right shoulder should be quite a bit lower than the left which sets the spine at a slight angle to the ground (it points to about 11 o'clock in the pictures below). This encourages a much shallower swing than you make with an iron and allows you to hit up on the ball - the swing bottoming out very slightly before impact and the clubhead beginning to rise as it strikes the ball. To get into the habit of creating this powerful address position every time, grip the club with your left hand and place your right hand on your right knee. Then simply move your hand across on to the club. 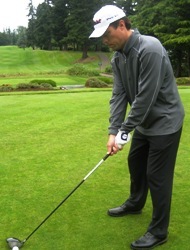 Grip it lightly, allowing the right elbow to hinge a little. If the slice still bothers you, add this tip to your armory.